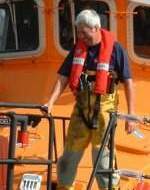 This site is dedicated to the hard working men and women who risk their lives everyday in our countries Lifeboats. Welcome to the Great Yarmouth and Gorleston Lifeboat Station which, in 2007, was presented with a Vellum by Mr Peter Nicholson CBE to commemorate 150 years of the RNLI operating in Great Yarmouth. .
You can listen to an introduction (840k wav file) written by Neal Duffield, Station Honorary Secretary and Operations Manager, and read by Capt. 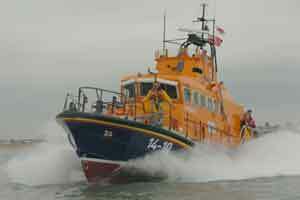 Lindsey Wigmore, Deputy Launching Authority, Great Yarmouth and Gorleston Lifeboat. 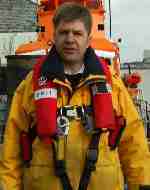 The Great Yarmouth and Gorleston Lifeboat Station has a long and complex history. 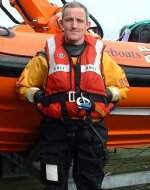 We are proud of the fact that we have been in the fore-front of lifeboat development. 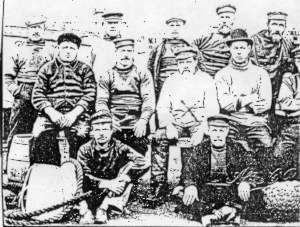 The ‘D’ class and ‘Atlantic 21’ Inshore boats saw much improvement as a result of work carried out by the crew and Honorary Officials of this station. One of the first ‘Fast Afloat’ lifeboats, the Khami a 44ft, ‘Waveney’, had a long and distinguished service career at Gorleston. The station has been brought right up-to-date with a major refurbishment of the wonderful Victorian boathouses, plus the provision of a new ‘berth’ for our ‘Trent’ class lifeboat – Samarbeta. 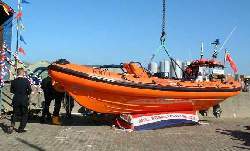 And in 2002 we took possession of our new Atlantic 75 (Seahorse IV) inshore rescue boat. The John and Mary Meiklam of Gladswood, our station’s first motorised lifeboat, is now housed in the Souvenir Shop. We have now seen many changes over the years. Nevertheless, the spirit of the R.N.L.I. remains as strong as ever, supported by the staunch efforts of the Branch Committee and the Ladies’ Lifeboat Guild and, above all, by the commitment of the crew, who selflessly put to sea in all weathers, to help others in distress. The Great Yarmouth and Gorleston Lifeboat Station would like to express its sincere appreciation to all those who contributed in the construction of this web site. 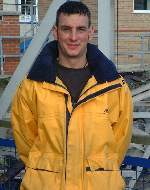 Special mention goes to Jeff Morris, Honorary Archivist of the Lifeboat Enthusiasts’ Society for the use of reference material from his book, “The Story of the Great Yarmouth and Gorleston Lifeboats” and to Capt. Lindsey Wigmore for the use of his photographs and for his assistance in obtaining relevant information. To respect the owners’ copyright, please contact the Great Yarmouth and Gorleston Lifeboat Station for permission to download any photographs. Living near the coast, we can fully appreciate the need for things to be very durable, particularly anything living outside such as garden furniture. That’s why we were on the lookout for some furniture sets that would really last the Gorleston harsh conditions. Weatherproof furniture that actually lasts has been very hard to find, even in 2016. 2017 update, we have still found this garden furniture to be very durable, the weatherproof Winawood is a sublime purchase, and the two year guarantee will not be needed I’m sure of it!